By now you’ve figured out that I have way too many thoughts running through my head. It has always been the case, but it can be harder to hide it as I write about diverse topics and try to weave topics together. Most every day, I start a post only to realize it’s going nowhere fast. Much like Hawaii, my blog has a minimum speed limit. Those posts don’t see the light of day. One day you’ll thank me for that. Someone recently urged me to write about my last Napa trip so she could live vicariously though my blog. That post never materialized. Too many moving parts and too few coherent thoughts prevented that from happening. But I do have a few things from that weekend. Alpha Omega is fantastic winery. Thanks to my brother for getting us in and kudos to the staff for taking such good care of us. Hartwell and Elyse remain my two favorite Wineries. Both produce excellent wines and have fantastic staffs. Hartwell is my luxury Cabernet Sauvignon and Sauvignon Blanc. Elyse’s wines run a wide stretch of the varietals, each excellent. I love their Cabernets and Petite Sirahs (on the Jacob Franklin label.) The Jacob Franklin Hayne Vineyard Petite is my favorite wine these days and the Quality/Price Ratio at Elyse is off the charts. Rick at Elyse or David at Hartwell make both places warm, welcoming and must visits. Drop my name, it might help. But don’t be upset if it doesn’t. If you must wear designer flip-flops this season, they should Gucci. Prada is so 2010. Sift in Napa makes great cupcakes judging by the half of the bacon cupcake I was allotted. In Downtown Napa, I love the service, vibe and coffee at Caffe Molinari. Sweetie Pie makes whoopee pies to die for. Someone please send me a care package. My BBQ is better than the 2 places I had BBQ at. I’m not sure if I’m that good or they weren’t. Dillon at Cindy’s Backstreet Café made every woman in my family swoon. Bello Family Vineyards in St. Helena is an up and comer. Nice wines, great staff and a spectacular tasting room. I sat next to Abbie Hoffman, or someone like him, at the Oakland Raiders Training Camp. I have never had a better Greyhound than the ones at Van Kleef in Oakland. There is magic in their grapefruit juice. I do love a great dive bar. Especially one with a Rhino, Boar and Bear holding court. Keep your eyes open for Stag’s Luncheonette in Oakland. You’ll hear about them soon. Strange de Jim is not feeding me information. His silence frightens me. The drama at work is never-ending. I am thinking of asking Lemal to write a theme song. I am very excited to being going to the Windy City for WorldCon. The Brotherhood without Banners will be well represented. An advance scout team from down under is in San Francisco and ready to drink. Good times will be had. If you learn nothing else from Robert Irvine, you need to use more salt and pepper. And you shouldn’t get ice in restaurants. Too many bad restaurants cause us to question all ice machines, even the clean ones. A six-foot pallet makes a great planter. But no fence is strong enough to support that weight. Yes I might have bought 50 more succulents. And some crazy grasses. The donuts at Donut Savant in Oakland are great. And small. My mom would still try to limit me to half of the tininess. And with that, I hope everyone has a wonderful weekend. Crack a few bottles, have a whole donut or kiss your loved ones. It’s all good. Sometimes, its even better. My name is Lee and I am an addict. It’s hard to put this out there. I’m pretty sure most of you will judge me harshly. I know I should know better , but I can’t help myself. I doubt you’ve been there. Its my own private torture. I have a succulent addiction. In a pinch I’ll settle for a cactus. I find reasons to go to Home Depot, Lowes or OSH looking for cool little $3 plants. Who could not love a $3 plant? In pots or in the ground, they grow, sport colors and make the world a happier place. Sadly, some die, but in Nature’s Kingdom that just makes room for more. And my addiction grows like a ravenous vine. Sometimes the hardware/home improvement stores aren’t enough. 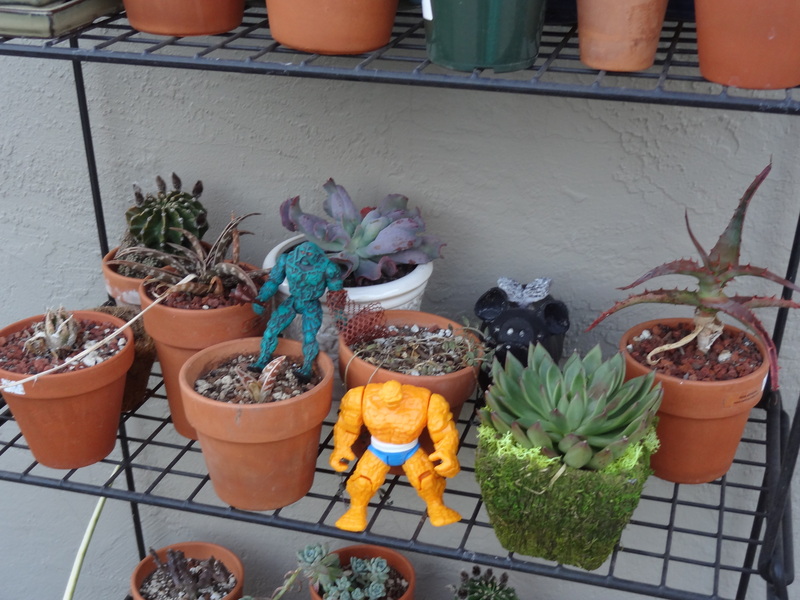 Then, I travel to Cactus Jungle in Berkeley. A joyous nursery devoted to colorful and eye-catching succulents. Its like my crack. I dream of adding colors, textures and visual magnets to my yard and the house. I can’t have too many. Aeoniums, agaves, aleoes, crassulas, echeverias, sedums, sempervivums and more. I go to Cactus Jungle too often. I walk in and the staff see dollar signs. when you spend $200 you get a $10 off. I often give them a full card (20 punches) and they almost always give it back to me for the next trip. For as bad as my addiction is, I am lucky that Lambchop humors me. Mostly. I wake in the morning to see how the patch outside my window is growing. I grab her to see things growing beyond my expectations. I slyly avoid pointing out the deaths and prat falls in the garden. Perhaps she notices the empty, growing stack of terra cotta pots. I haven’t gotten to hiding them yet. Sometimes the squirrels dig out the ones I’m propagating. And I use the word propagate too often I’m told. It is about to replace Spartacus as the drinking game du jour (“apologies” and “gratitude”) in our home. 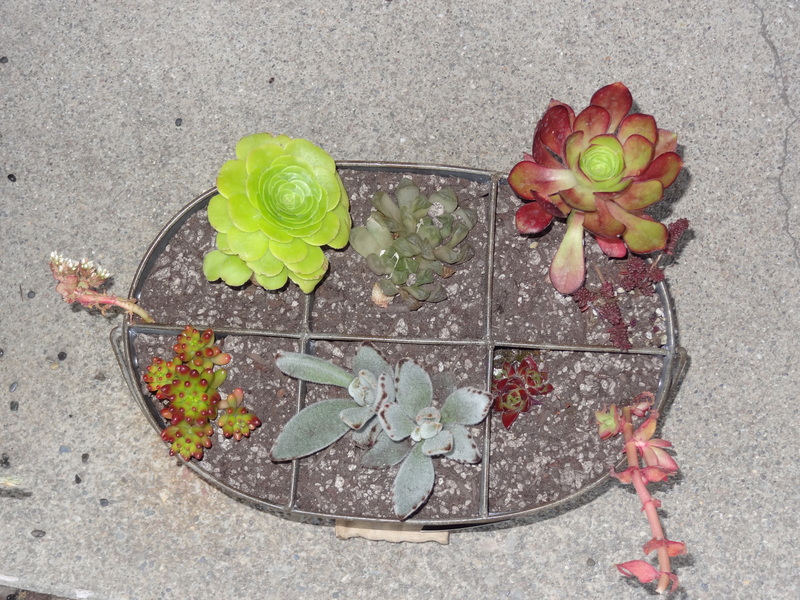 For several months I had talked of making a pilgrimage to Succulent Gardens in Castroville. This might be the holy grail of succulents. I found them when I was looking for ways to make a vertical garden and they specialize in them. They specialize in everything. Before I get ahead of myself, we had to get there. Lambchop had suggested a day trip a while back. We had settled on May 26, because we were free. It turns out so was most everyone else. It was the Saturday of Memorial Day weekend and the road was packed. Castroville, you see, is the artichoke capital of the world. Perhaps everyone was going there. Or could it be that Castroville is on the way to Monterey and Carmel. Well, maybe that was it. Our 110 mile, two-hour drive took closer to three hours. That happens on holidays. we got there around 2:30pm and they closed at 4pm. Would I have time to browse? Seriously, this place has 4 acres of plants. Driving in, there was small empty parking lot and a giant “grow house.” I don’t think it was a hot-house. The landscaping facing the road and around the grow house was fantastic . I should have taken photos but I didn’t. I was awestruck. We walked in and were blown away with what we saw. Plants, Plants and More Plants. This photo I took. This is a very small sampling of what we saw. I was overwhelmed. 2′ plants. 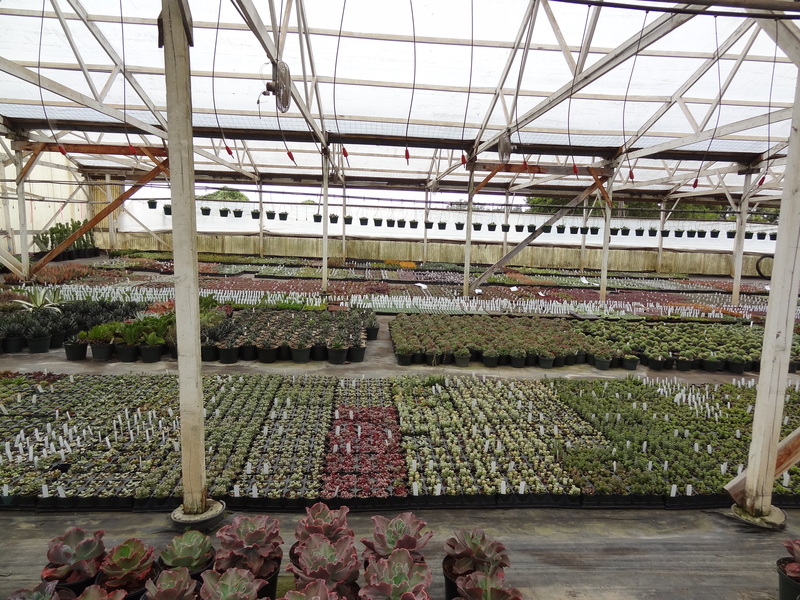 3″ plants 4″ plants 6″ plants 8″ plants and 10″ plants. It took an hour just to walk the 2 houses and small open space that were open to us. I had visions of spending thousands of dollars to feed my beast, but I limited myself to a modest number, taking home 3 larger plants and about 20-25 smaller ones. One of the joys of succulent overload is matching up various smaller plants in bowls or unique containers. They tend to live harmoniously and grow into a visual delight. While some folks plant larger plants in this type of arrangement, I tend to go smaller so as they grow I can see what’s happening and then add or change the arrangement to suit the container. I had bought a lot of very small plants to build arrangements and a few gifts. 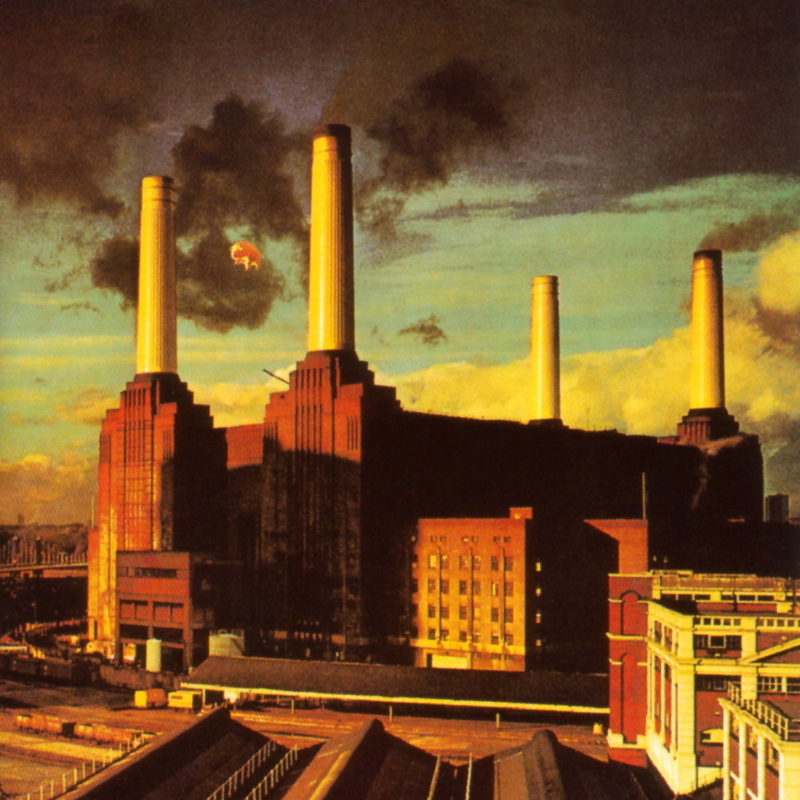 As we walked – well, wheeled the wagon – to the car Lambchop commented on how restrained I was. 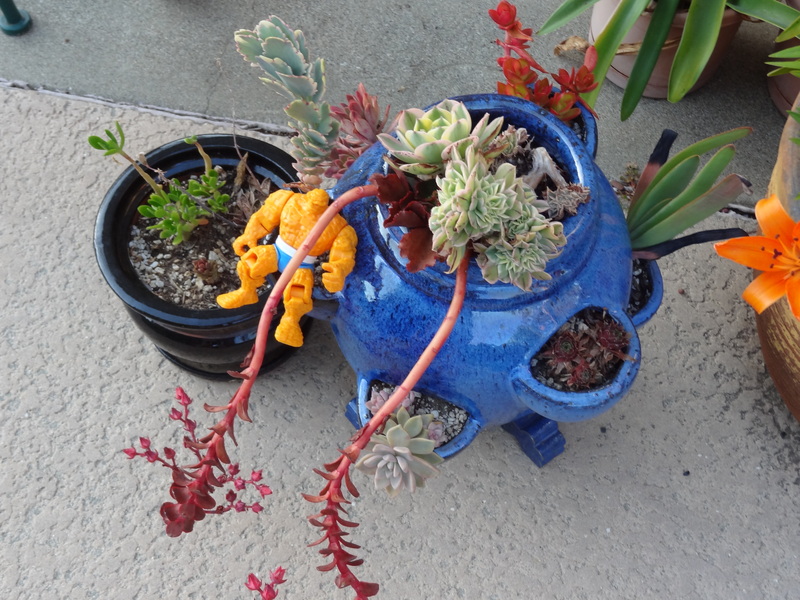 In retrospect, I did hold back — but then I was already planning my next trek to Succulent Nirvana; Disneyland in Pots. Probably August. I could have spent a few thousand dollars and still wanted more. No worries, It was no more than a very nice dinner. No, not French Laundry nice. One of the most striking about the excursion was the help. The two gals working the nursery were helpful, knowledgeable and, above all, patient. As one helped me with the two fluorescent Aloes I wanted (they looked like someone set them aside and angering other patrons was not on my to do list) I made my usual comment, “I’m hope plastic is OK.” Believe it or not I think I was in the last place on earth that took checks. Cash or Check was my only option. For just this reason, I always keep an emergency check in my wallet. 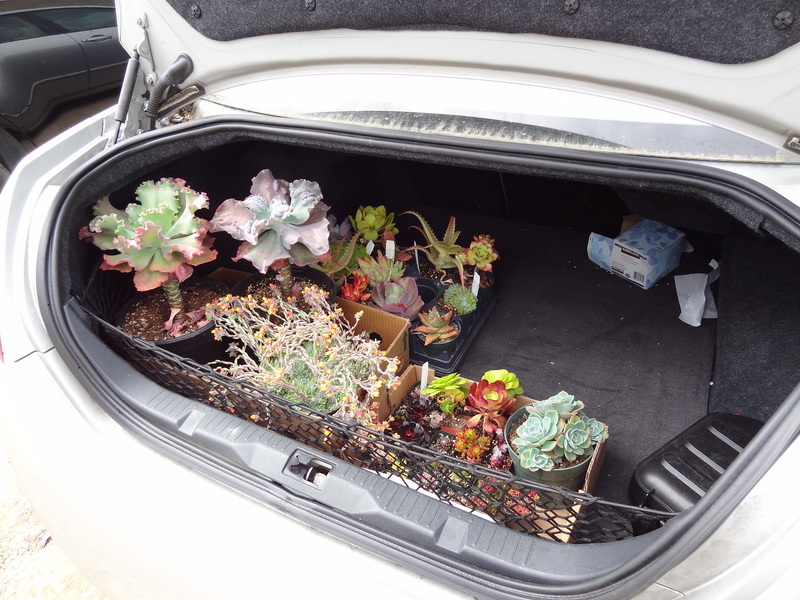 I would have had to put several plants back, I didn’t have that much cash in my pocket. I’m still amazed at that checks are accepted at a retail establishment. Well, it was Castroville. I realize that I have a monkey on my back. I’ve embraced him and garden frenzy I create and maintain daily. Today I ordered several difficult to find books on succulents and their health, propagation (DRINK!) and sprawl. My monkey needed a banana. He’s satisfied. For now.